Photos by Amy Poche. © Amy Poche 2002; all rights reserved. Top: Northern Dancer. Second Row: Vice Regent, Victoria Park. Third Row: Canadiana, Windfields. Bottom Row: South Ocean, New Providence. Originally the property was the famed PARKWOOD STABLES owned by Colonel R.S. McLaughlin of Canada. It was purchased by E.P. Taylor, and became known as THE NATIONAL STUD of Canada. It was later renamed WINDFIELDS FARM, when the original WINDFIELDS property near Toronto was sold and developed. First home to WINDFIELDS himself, BULL PAGE, and later Taylor-bred champions NEW PROVIDENCE, CANADIANA, and NEARCTIC, it was also the birthplaceof NORTHERN DANCER, NIJINSKY II, THE MINSTREL, and STORM BIRD. 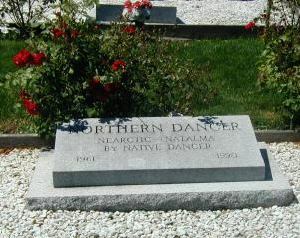 Thecemetery is located near the stallion barn, and includes some of the most important names in Canadian breeding including NORTHERN DANCER (sire of NIJINSKY II, THE MINSTREL, NUREYEV, STORM BIRD, VICE REGENT, etc. ), VICTORIA PARK (sire of KENNEDY ROAD, dam's sire of THE MINSTREL),WINDFIELDS (sire of CANADIAN CHAMP, VICTORIANA; dam's sire of VICE REGENT),VICE REGENT (sire of DEPUTY MINISTER, REGAL CLASSIC, etc. ), NEW PROVIDENCE (sire of SOUTH OCEAN). Also buried here are the mares SOUTH OCEAN (dam of STORM BIRD, NORTHERNETTE), and CANADIANA. Itsmost recent interment was for ARCHERS BAY, who sprang from six generationsof Windfields-bred mares and won the Queen's Plate in 1998. There is also a memorial stone for the broodmare BALLADE, who is buried at BrookdaleFarm in Kentucky. BALLADE was the dam of champions GLORIOUS SONG and DEVIL'S BAG as well as the important sire SAINT BALLADO. -- A.P.